Started in 1963, this BBQ restaurant has grown into a popular restaurant, visited by locals and travelers all over the country. They offer a counter service restaurant, large gift shop and a bar at the other end. They have a limited menu, offering their popular smoked BBQ and several sandwich and burgers. 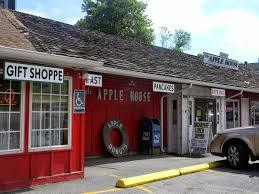 They are also known for their mini apple cider donuts and have been very popular over the years. Debbie and I stopped in mid June 2018, We shared a large BBQ pork sandwich platter with 3 sides. One of the sides was baked beans. Different that most, had a least 5 kinds of beans and pineapple tidbit, kinda like a sweet and sour beans, very good! Really enjoyed the smoky flavor in the pork. Hi I’m Chef David Lee Bishop (Chef Dave), welcome to From The Chef To You! I’ve created this site to share my passion for cooking with those that love to cook and those that would like to learn.